I hated the idea of an animated Spider-Man movie, especially for a character like Miles Morales. I would’ve prefered he have his own live-action movie because he’s Afro-Latino. I truly believe audiences need and want to see themselves portrayed in this popular genre. After the film’s promotional material was released and I saw the animation, Sony had my money. 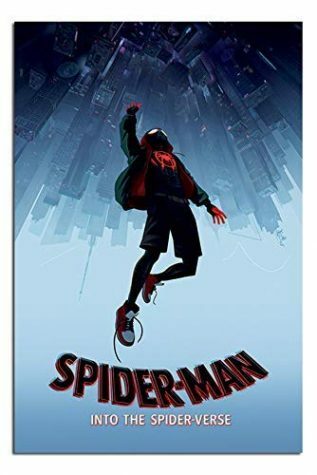 Directed by Bob Persichetti, Peter Ramsey and Rodney Rothman, the film follows Miles Morales, a teenager living in Brooklyn, New York, whose life is turned upside down when he is bitten by a radioactive spider. On top of that, a dimension opening device traps other Spider themed heroes in his dimension. With the task of helping his new allies get back to their dimensions, Miles Morales must learn to control his new found powers while saving everything he cares about. Morales is a relatively new character in comic book lore, making his debut in 2011. The character became really popular and already made appearances in tv shows and video games. Naturally, it was time for him to make his debut on the silver screen. The voice cast for this movie is stellar; Shameik Moore (Miles Morales), Jake Johnson (Peter B. Parker) and Hailee Steinfeld (Gwen Stacy) stood out. They feel authentic to the persona that they are playing, most notably Johnson. Appearing in the show “New Girl” and other comedy movies, the audience can see his personality translate into Peter B. Parker. The film’s biggest accomplishment is its animation. It’s unique, creative and is literal eye candy. Watching the movie is like opening a comic book, the tiniest details make their way into the movie. t is just impressive seeing how committed they were to making this like a comic book. Art styles in comic books vary, and the movie takes full advantage of that. With the introduction of Spider-Man Noir (Nicolas Cage), Peni Parker (Kimiko Glenn) and Spider-Ham (John Mulaney), they all have different animation corresponding with their universe, for example, Peni is designed in anime fashion and is portrayed with a lot of attributes that an anime character has. Avid comic book fans will find themselves floored with the amount of easter eggs and references this movie has. As a comic book fan myself, I had the biggest smile on my face seeing details that would go over the general audiences’ heads. The film feels real and full of heart. It is a coming-of-age tale about power and responsibility. The film also deals with themes of adaptation and loss. Loss is prevalent through the entirety of the film, portraying how it can leave someone defeated but also inspire hope in life’s darkest moments. What makes this movie great is that it’s weird, and not in a bad way. It takes risks and the end result is that it becomes one of the best superhero movies ever. Overall, the movie is a must see and one of the best films of the year. It’s filled with comedy, action and heartfelt moments that are more than worth the price of admission.